Futomaki is a type of Japanese sushi that is rolled into a long thick cylinder. A literal translation of futomaki is "fat rolled sushi." It is rice and fillings wrapped in dried, roasted seaweed (nori), and then sliced into smaller bite-sized pieces. Futomaki is typically filled with a variety of vegetables; however, it might also include sweet dried fish known as sakura denbu, as well as a sweet, rolled egg omelet called tamagoyaki. While the most standard futomaki fillings include cooked spinach, cucumber, egg omelet (tamagoyaki) and (cooked and seasoned dried daikon), the fillings are limited only by the creativity of the sushi chef. 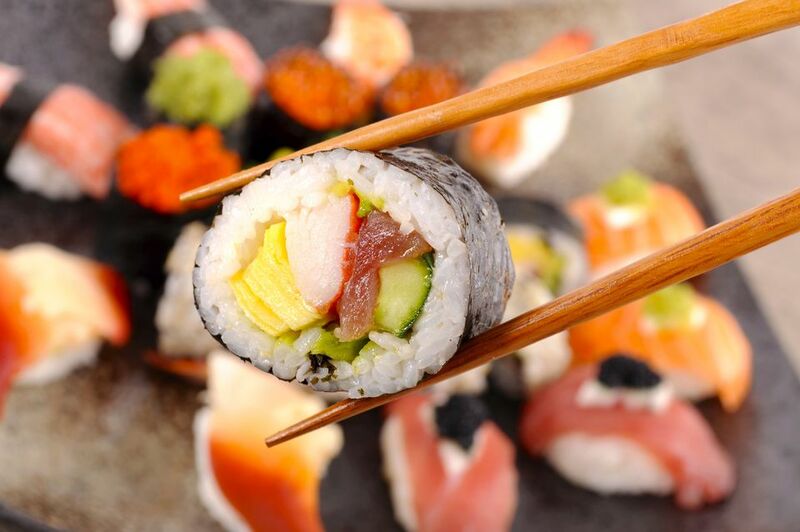 What is important to keep in mind, is that the flavor combinations of the fillings should be harmonious, and when the futomaki is sliced, the fillings should appear colorful and beautiful. This might seem difficult to achieve, but follow the recipe below to see how easily futomaki can be made. You will need a bamboo sushi mat to make futomaki. Note: while there are multiple steps to this recipe, this futomaki dish is broken down into workable categories to help you better plan for preparation and cooking. In a small bowl, wash, rinse, and drain the kanpyo (dried daikon radish). Then soak in fresh water for about 1 hour until it is soft and pliable. Squeeze excess water from kanpyo. Cut softened kanpyo into about 8-inch long pieces. In a medium pot, combine dashi soup stock, soy sauce, sugar, and mirin. Bring to a boil over medium heat. Add kanpyo and simmer over low heat until the liquid is almost gone. Let it cool. Beat eggs and sugar in a small bowl. In a small pan heat canola oil, making sure to coat the pan. Add the egg mixture to create a thin layer. then slowly roll, or fold, the egg omelet to make a thickly rolled omelet. Remove from pan and allow it to cool. Cut it into long sticks. Lay a piece of plastic wrap over the bamboo mat. (This makes cleanup easier.) Place a large sheet of dried, roasted seaweed (nori) over the plastic wrap on the bamboo mat. Spread evenly 1/4 portion of sushi rice on top of the dried seaweed sheet. Place kanpyo, omelet, and cucumber sticks horizontally on the rice in the center. Roll up the bamboo mat, pressing forward to shape the sushi into a cylinder. Press the bamboo mat firmly and remove it from the sushi. Set sushi aside and repeat to make 3 more futomaki rolls. Wipe a knife with a wet cloth before slicing the futomaki. Cut the rolled futomaki sushi into bite-sized pieces.